Google Reader has recently linked with google talk to make one's shared items visible to Google Reader enthusiasts in your google talk friend list. 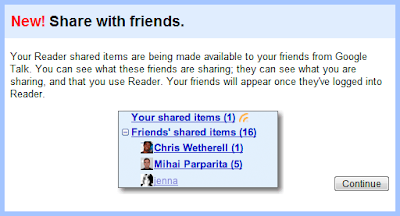 Google Reader users can now see what their friends are sharing; they can see what you are sharing. When you log into the Google Reader , the change will be notified and once you click the button "Continue", you 'll be automatically subscribed to items shared by your friends. Shared items can be seen at the top left navigation area under "Friends' Shared Items" list. Reader and Talk are Friends now.